The Back Story: Calling it a one-of-a-kind design, Ralph Rodheim fell in love with the Rhodes 33 sloop at first sight when he was 16. The young lady he was dating at the time set in motion a course of events eventually leading to his introduction to the Rhodes 33. “I was a Newport Beach lifeguard and dating a young lady who asked me to go sailing with her uncle. I had never been on a sailboat,” Rodheim said. Once on the boat, Rodheim ended up spending more time talking with the uncle instead of his date. A few months later, the uncle asked Rodheim if he would join him in racing on the waters. Rodheim had never raced a sailboat before, but the uncle told him they would learn together. It was right around then Rodheim’s fate was sealed. In 2006, Rodheim purchased Madness with his partners Bill Jacoby and Bob King. The boat was previously owned by Gavin Herbert. Since then Rodheim has been leading a revival of the Rhodes 33 sloops. The sloops were designed to accommodate overnight crews and built to participate in offshore races. These races were in open water and upwind. Madness was the last Rhodes 33 ever built. A Hard Day’s Night: Though boat maintenance is a constant, Rodheim said about $70,000 went into rebuilding Madness. Even more, it took two years to rebuild her. Thanks to the rebuild, though, Rodheim actively sails what he says is a “fabulous sailing boat.” While Madness used to make it down to the western Mexico coast, Rodheim said nowadays she races closer to Newport Beach. What’s inside? Rhodes 33 sloops are known for being a narrow racing boat built with a deep cockpit. Made out of mahogany, other notable features include a two-burner stove and head. The outboard fitting provides the boat’s auxiliary power. There is no bridge deck. Notable Moments in Boat’s History: Madness was commonly spotted racing around Newport Harbor from the 1940s to the 1960s. 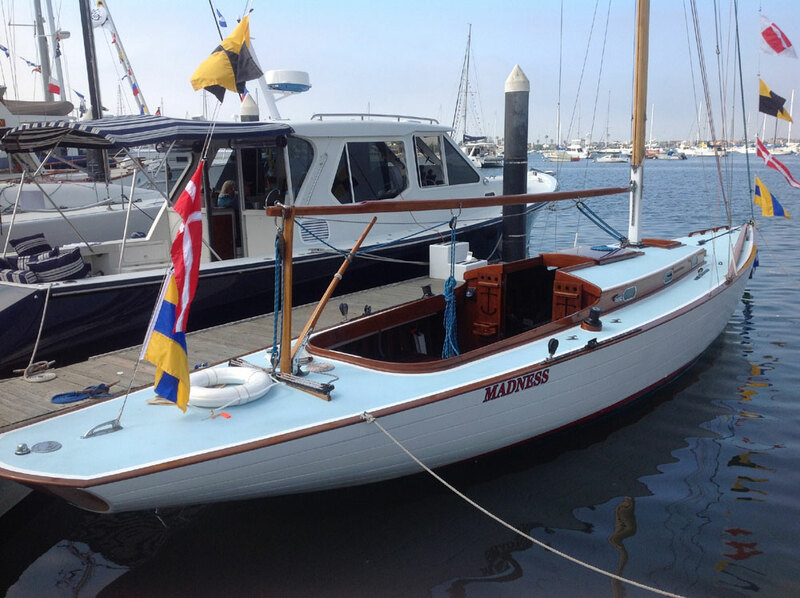 The Rhodes 33 was officially introduced in Newport Beach by South Coast Boat Building in 1938 by Phillip Rhodes. Madness is one of 20 Rhodes 33 sloops built after World War II. Production of the boat came to a halt during the war, but another 20 were built soon after the war’s end. Recent Notes: “They’re amazing boats,” Rodheim said, adding there are two Rhodes 33 sloops in Newport Beach and another four or five looking for a new home. Rodheim, who has become a leading figure in reviving the Rhodes 33 sloops, said anyone who is looking for a unique boat should reach out to him and inquire about the available classics. Where Currently Berthed: Newport Beach Harbor.